Ah, German cooking. It's kind of a specialty of mine. If you're going to cook German you need to go with the most classic of German ingredients: salmon. I recall my days in Munich as a youngster. You can't even walk down the street without passing a dozen salmon restaurants and having street vendors passing you salmon on a stick. Plain and simple: salmon is synonymous with German cooking, even amongst those who use the word synonymous properly. 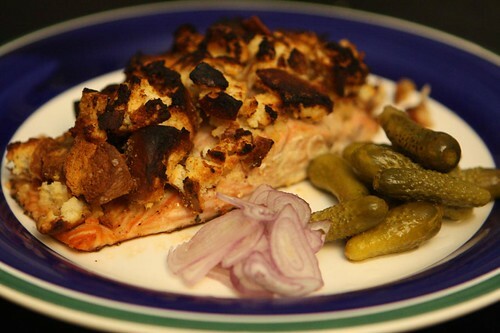 So it was that I set off to recreate the classic Bavarian specialty: pretzel-crusted salmon. I took the leftover pretzel from last week (that I'd stashed in the freezer), broke it into chunks, and lightly toasted it in the oven. After it came out I crumbled it, tossed it with some SchoolHouse Kitchen SweetSmoothHot mustard and placed it on top of a King Salmon fillet and threw it in the oven. After it came out I served it with some sliced raw onion and cornichons. And what Bavarian dinner would be complete without an appropriate beer? 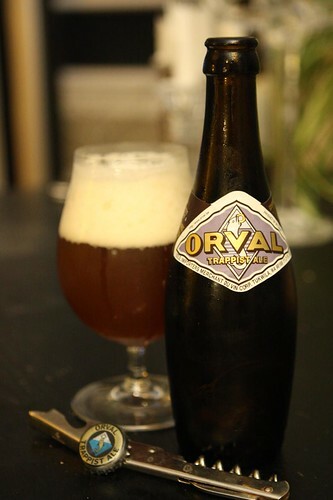 For tonight's dinner I decided to pair it with a bottle of Orval that Jen had kindly purchased for me the other night as a present. My only regret is that Jen wasn't here tonight to experience this authentic Bavarian meal. It's as if our apartment had been transformed into a real Bavarian Biergarten! 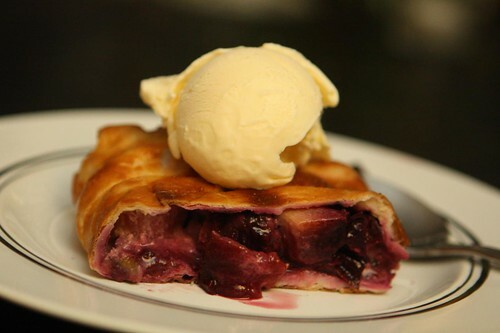 For dessert I opted to heat up some of the leftover strudel from the other night. This dessert had two more popular things from Bavaria: Mascarpone and vanilla ice cream! And that, my friends, is how you make an authentic Bavarian Oktoberfest dinner. * Warning: 90% of the information in this blog entry is false. Happy Oktoberfest!